We joined the family operation with Mom and Dad Wardberg in 1978 and moved to Grampa and Gramma Wardberg's homestead after purchasing it from Mom and Dad. Being that both of us grew up in Angus families we've proudly continued with the tradition and have bred up Commercial and Registered herds we are very proud of. Horses are another passion that we expanded on - starting a small herd of Paints in the early 1990's. This ranch lifestyle also included a combined total of 62 years involved with 4-H as members and leaders of the Beef, Lighthorse, Sewing, Woodworking and 4U projects. All of us still enjoy supporting the 4-H program as judges and clinic instructors. Through the years, Don and I have also been involved in the School Board, Fish and Game, Roping Club and our local community Hall. We don't devote a lot of time to hobbies but I enjoy sewing and Don a little hunting. Darby and Sarah were married July of 2007. 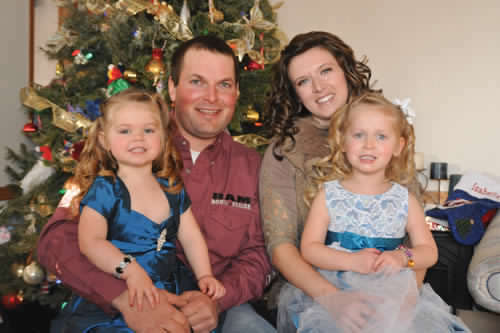 They met while attending Olds College where they both completed Livestock Production and Management. Sarah also graduated from the U of A (Agriculture) and brought into this 'Angus' family, a herd of purebred Simmentals from her family's, the Cloutier's Kimlake Farms operation. 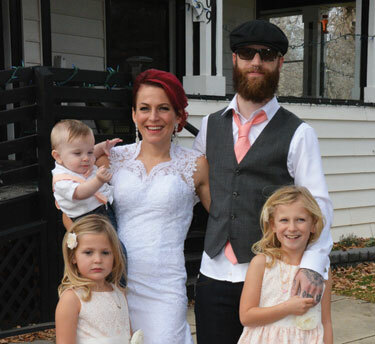 Kalee and Sean own and operate their business called "Brashtones" in Maple Creek, SK. 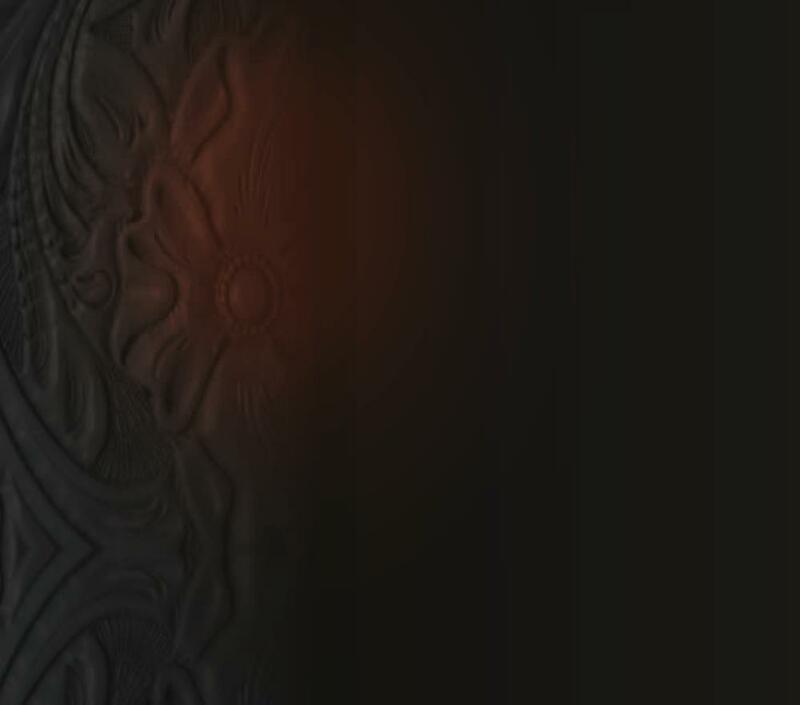 Sean is a respected tattoo artist and his work is the main service offered at Brashtones. Part of the business location also stocks skateboards, clothing, shoes etc. Kalee also works for the Cypress Hills Health region in the local Maple Creek hospital. She also owns purebred stock registered under the name of Kay Dee Angus. Don and Connie Delorme own and operate South Shadow Angus, a purebred Angus program which is part of and in addition to the Delorme Livestock Ranch operations of commercial Angus cattle and APHA / AQHA Horses. 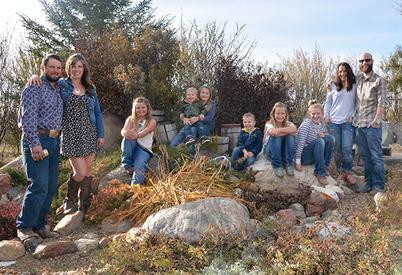 Our son Darby, his wife Sarah, and their two beautiful daughters; Isabella and Mackayla are actively involved in and with their own ranch holdings. Our daughter, Kalee also has two beautiful daughters; Nevaeh and Aeverie and she and Sean have our only grandson; Oskar. They run a few cows here also and the grandkids enjoy the ponies and time here on the ranch. Today, along with Connie's parents, Alfred and Josephine Wardberg, time and resources are pooled for the day to day operations. 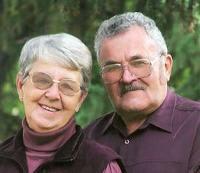 Don's parents, John and Flo Delorme are always a phone call away when an extra hand is needed. The Grandaughters started arriving in 2008, so we have come full circle with sandboxes, swings and toys laying about. With four Grand Daughters to spoil, who has time or needs a hobby ! for three generations, and is well on its way into including the fourth and fifth generations. Their "Boundary Ranch" genetics are offered through purebred Angus and Simmental herds as well as a commercial Angus herd. Home is a few miles East of Robsart. With the addition of their own land base and cattle, they are now the fourth generation. The Jay En Dee Angus herd name has been transferred to Isabella and Mackayla. The Jay En Dee prefix is prolific in the registered Angus cow families, as it was the herd name used by Don's parents. Nevaeh, Aeverie and Oskar's cattle are registered under the herd name; Prairie Pride Angus. This name was used by Connie's parents in the 60/70's for their Angus cattle. The eldest generation actively involved is Mom and Dad; Josephine and Alfred Wardberg. Mom and Dad started their mixed farming operation shortly after their marriage in 1960, with the purchase of some land from his parents. With Grandpa's sudden passing, they managed and worked the place for Gramma, eventually purchasing it all after Gramma's passing. During the past five decades they have adjusted and persevered, despite the economic challenges of agriculture. Through all this they managed to raise three daughters. All three of us married into cows and cropland. Alfred and Jo have six grandchildren; two granddaughters and four grandsons and four great grandaughters. Largely a mixed operation today, their success can be measured by the creditable black cow herd and land base which produces their grain crops and livestock feed. In 1985, Mom and Dad semi-retired to a place near Maple Creek, were they continued with their Registered herd and large garden. In the early 90's they started dispersing their cattle herd to sons, Don - South Shadow Angus, and Allan - Bar Seventy One Angus. Fully retired now, they live in Maple Creek and enjoy camping and visiting their families and friends. John and Florence's life together began in 1953. 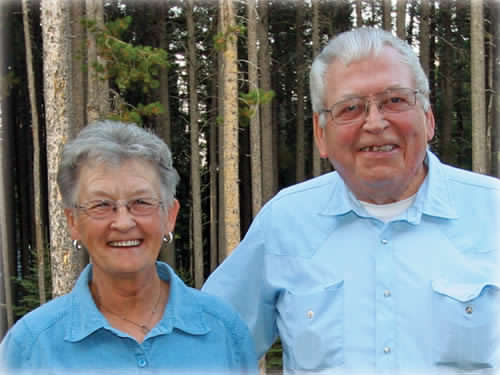 During the first 14 years, Mom and Dad managed the cattle herd and feedlot for John Frank near Scout Lake. In 1967 a ranch, Double J Angus, was purchased near Consul and Mom and Dad moved to manage this new place. They brought with them their family of three boys, two girls and ten head of Registered Black Angus cattle known as Jay En Dee Angus. The family's participation in the 4-H Beef project lead them down the show trail - participating in the very first Canadian Western Agribition as well as numerous miles made to shows in Alberta and Sask. John and Florence's family today consists of eight Grandchildren; five grandsons and three granddaughters as well as five great-granddaughters and three great-grandsons. 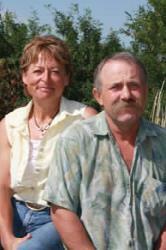 The ranch's first generation, Alfred's parents, was Ole (Asmund) and Esther Wardberg. Ole Wardberg immigrated from Norway as a young man in 1927 and arrived in this area in 1932. He married Esther in 1936 and in 1945 moved to the new place North of Robsart, where they raised their family of three daughters and three sons. The farming operation gradually grew. Ole introduced one of the first groups of black angus females into the area in 1948. In 1951 he purchased an additional farm where Alfred and Josephine now live. With the added land he enthusiastically continued to raise and increase his Black Angus cattle numbers and crops. My Grandparents and parents were also avid growers of trees in an area less than hospitable to anything but sage and cactus. Pine trees, yard and field shelter belts were planted and hand watered. Grampa Ole passed away in 1962 and Gramma Esther passed away in 1984.